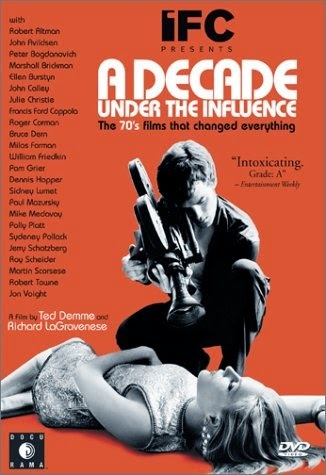 Tag line: "The '70s films that changed everything"
Co-directed by Richard LaGravenese and Ted Demme (who passed away shortly after completing this movie), A Decade Under the Influence is a documentary chronicling what proved to be a fascinating period in American film: the 1970s. Interviewing a number of the decade’s movers and shakers, including Francis Ford Coppola (The Godfather), William Friedkin (The French Connection), Martin Scorsese (Mean Streets, Taxi Driver), Robert Altman (MASH) and writer Robert Towne (Chinatown), A Decade Under the Influence is as much a time capsule of this era of creativity as it is a loving tribute to the men and women who, with their energy and determination, forever changed the face of American cinema. Broken into 3 parts (it was broadcast on the Independent Film Channel as a trio of one-hour specials), A Decade Under the Influence begins by examining the inspirations that drove these filmmakers to take on the studio system (which was collapsing at the time) and save American films from drifting into obscurity. Spurred on by such foreign directors as Truffaut (The 400 Blows, Jules et Jim), Renoir (Grand Illusion, The Rules of the Game), Fellini (8 ½, La Dolce Vita), Kurosawa (The Seven Samurai), De Sica (Bicycle Thieves) and Bergman (The Seventh Seal), this young group of actors, writers, and directors shook up the status quo, creating works that gave audiences what they wanted, namely movies reflecting the time in which they lived, from the sexual revolution (Shampoo) and Women’s Lib (Alice Doesn’t Live Here Anymore) to Watergate (All the President’s Men) and the Vietnam War (Coming Home, Apocalypse Now). Along with these socially conscious films, the ‘70s also gave birth to the summer blockbuster, with pictures likes Jaws and Star Wars taking in more money than Hollywood had ever seen before and, in the process, bringing big business into the equation. All at once, movies were more than a form of artistic expression; they were a million-dollar industry. A Decade Under the Influence covers some of the same ground as Easy Riders, Raging Bulls, a similar documentary released the same year which also featured clips from such seminal works as Bonnie and Clyde, Easy Rider, The Last Picture Show and The Graduate. However, A Decade Under the Influence takes things a step further by focusing heavily on the B-movies of Roger Corman (Foxy Brown) as well as the indie flicks of John Cassavetes (A Woman Under the Influence), which were every bit as important to this period as the mainstream features. Clocking in at around 3 hours, this documentary delves head-first into its subject, exploring all aspects of what it was that made the ‘70s such a unique era for American films.